1922 advert for the Federal. 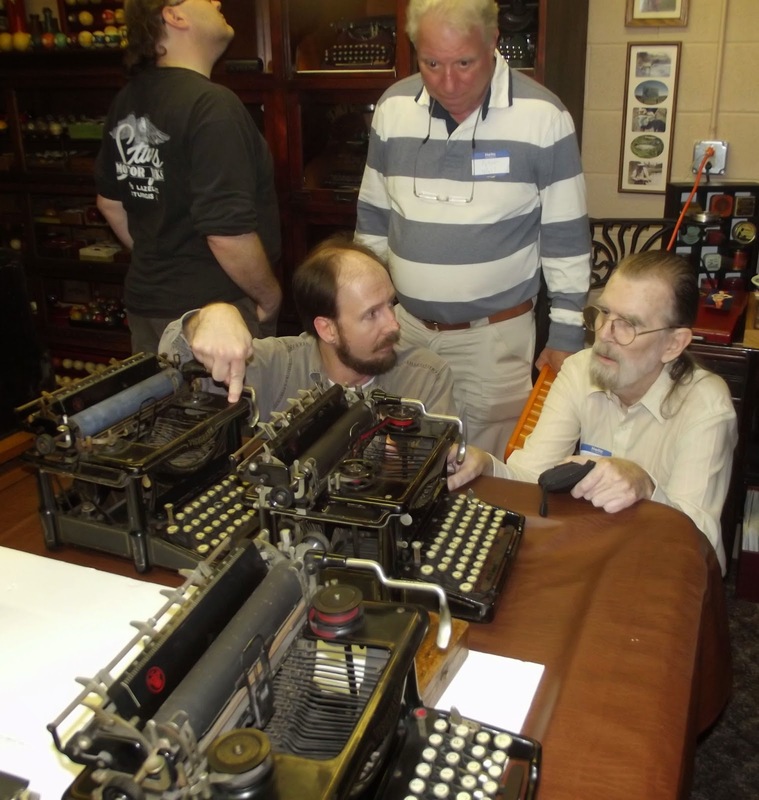 It seems not to have been made as the "Visible"
German-born Charles Spiro, the so-called "dean" of typewriter inventors. 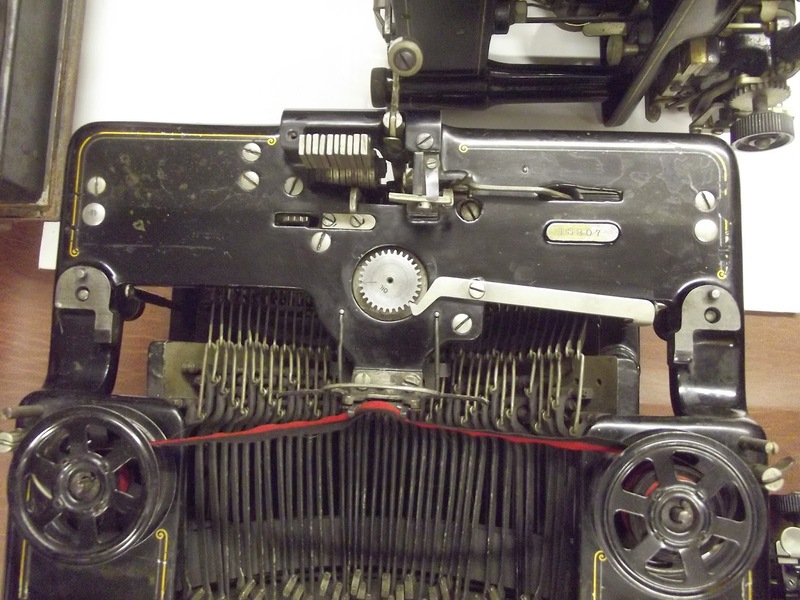 Yesterday I finally got the chance to take a close look at, and to photograph, the Federal typewriter held by the Powerhouse Museum in Sydney. Unfortunately, the lighting in the bowels of the museum, where the dusty Federal is stored, is not great, so the photos are a bit dim. Nonetheless, I was able to get a very good idea of the extent to which the Federal, the only known example of this model in existence, differs from its predecessor, the Charles Spiro-designed Visigraph (the Federal has the VTC logo on its paper plate). 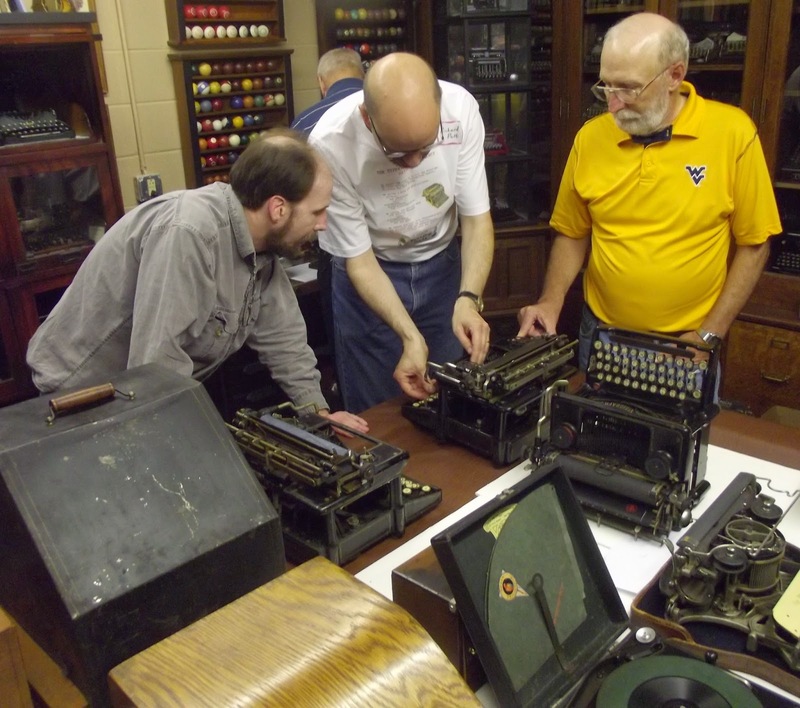 One of the three Visigraphs seen at Herman Price's Typewriter Collectors' Gathering in West Virginia last October. From what I can gather, there are no more than 15 Visigraphs in collections around the world, and I have been fortunate enough to have seen four of them at close range - those owned by John Lavery in Queensland and by Richard Polt, Will Davis and Herman Price in the US. None of the known Visigraphs has a segment, but the Federal does. I am now probably one of the few people in the last 90 years to have seen a Visigraph and a Federal! 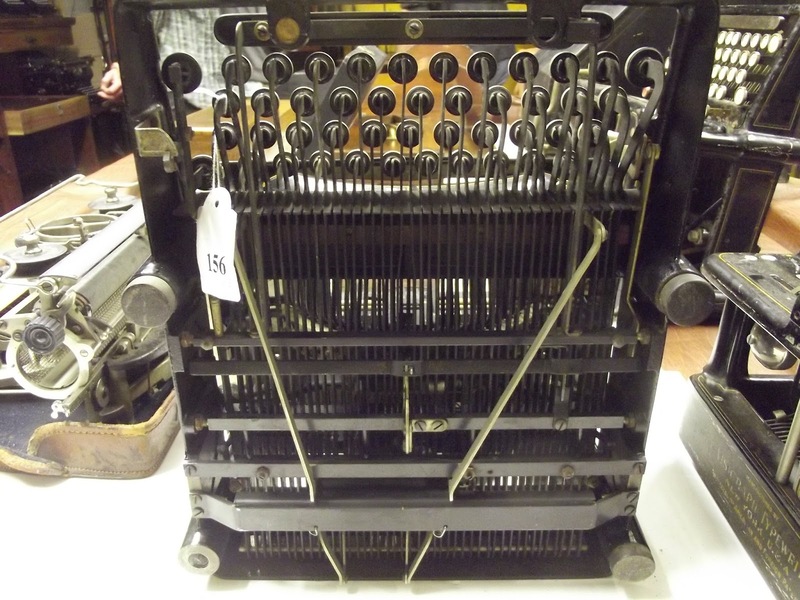 The Federal, serial number 60512, was given to the Powerhouse Museum in 1939 by the Australian office supplies company, Chartres, an organisation very closely associated in this country with Remington. 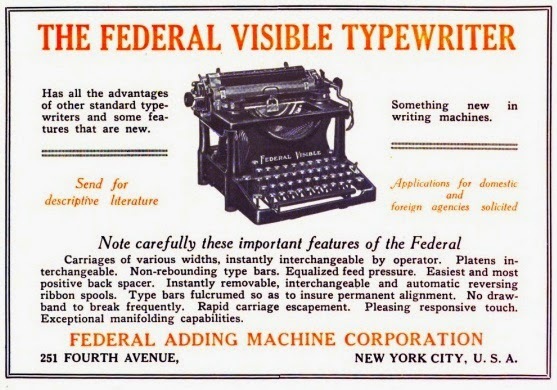 The Federal was probably made in 1921. It would seem the non-segment Visigraph was only manufactured between 1912 (not 1910, as commonly believed) and 1916, or at the very latest 1917. Still, it was heavily advertised in 1915-16, which makes the fact that there are so few existing models all the more surprising. Seeing and photographing the Federal at the Powerhouse yesterday has led me to do some research on the history of the Visigraph and the Federal. 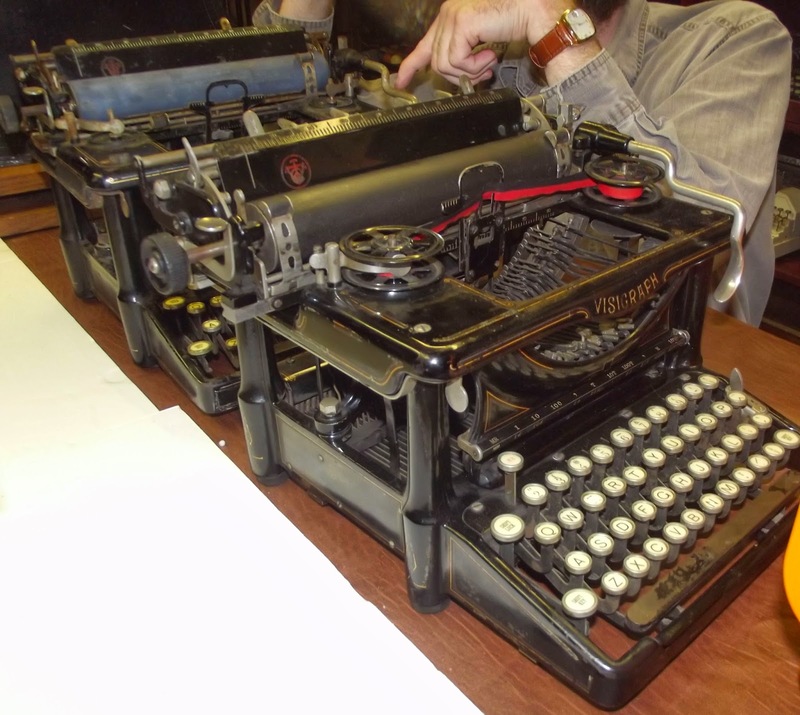 The sequence of events relating to these two typewriters was well documented by the trade monthly Typewriter Topics. 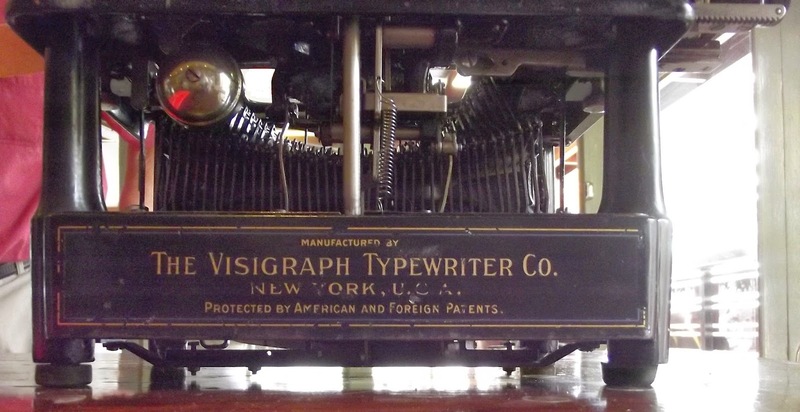 March 1912: The Visigraph Typewriter Company, with $160,000 in capital stock, is established. Later that year the Visigraph is launched on the market. 1915: Agencies in Britain, India and South America are secured. 1915-1918: There is no doubt that World War I impacted greatly on Visigraph, both in terms of manufacturing at home and selling abroad. 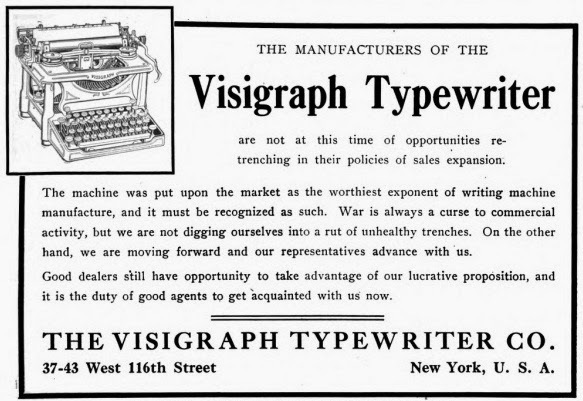 As with other manufacturers, from 1917 Visigraph was involved in assisting the US war effort with munitions manufacturing, and this curtailed the making of typewriters. 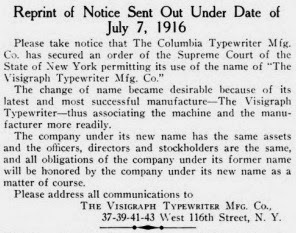 July 1916: The Columbia Typewriter Manufacturing Company is allowed to produce the Visigraph under the name of the Visigraph Typewriter Manufacturing Company. Visigraph reports that it has "never [been] so rushed to keep up with demand", yet at the end of the year the British agency is lost. 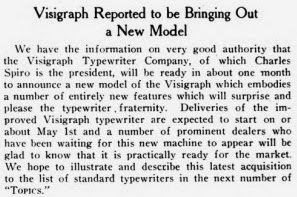 April 1917: Charles Spiro announces that he will bring out a new model Visigraph, which, among other improvements, has a segment. 1918: The Visigraph disappears from the market completely. 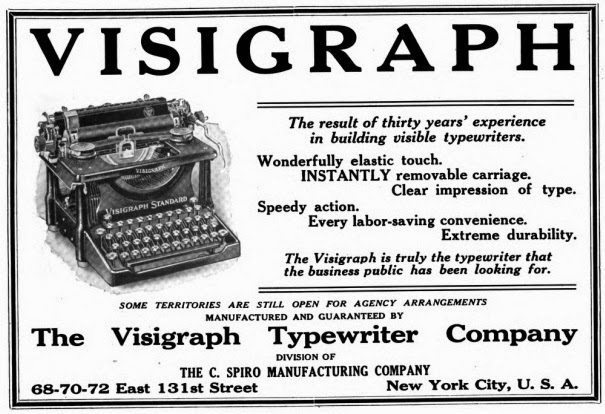 April 1919: The Visigraph Typewriter Company sells to lot on which its factory stood on West 116th Street, New York City, to the Institutional Synagogue. 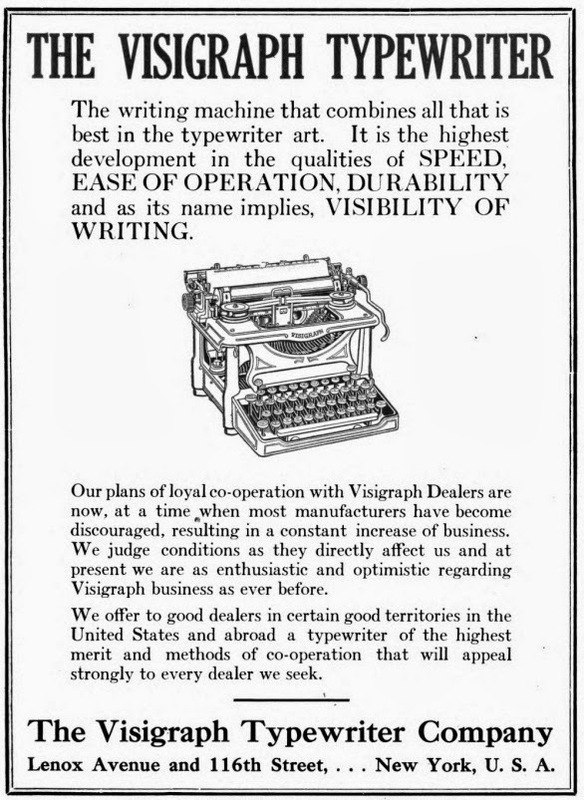 1919: A restructured Visigraph Typewriter Company is announced and the new model Visigraph, with a segment and using a "modern knife blade typebar", is advertised. It is to be made by the C.Spiro Manufacturing Company, which has acquired all the liquid assets, patents and goodwill from Visigraph. 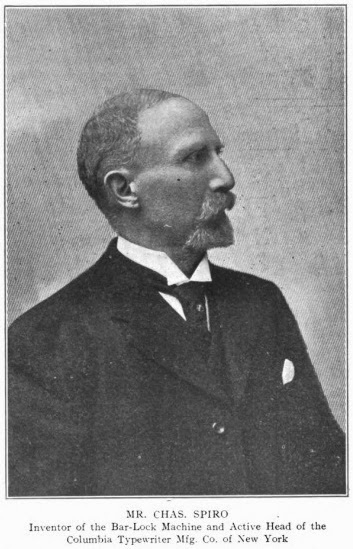 Charles Spiro is naturally president of the company, with his sons Frederick Lewis Spiro (1884-) and Walter Jesse Spiro (1882-) as secretary and treasurer respectively. 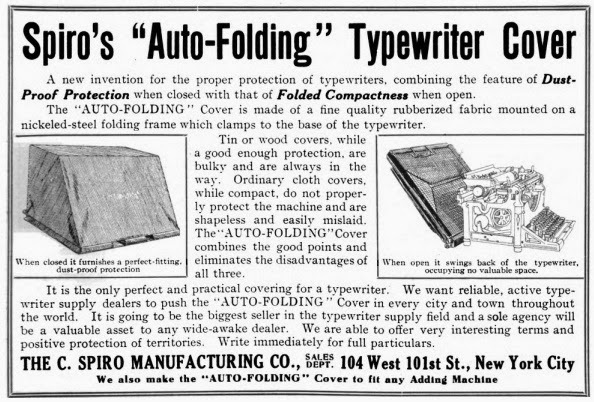 Frederick and Walter Spiro had formed C.Spiro Manufacturing in 1910, to make office equipment such as typewriter covers and bins and automobile accessories. 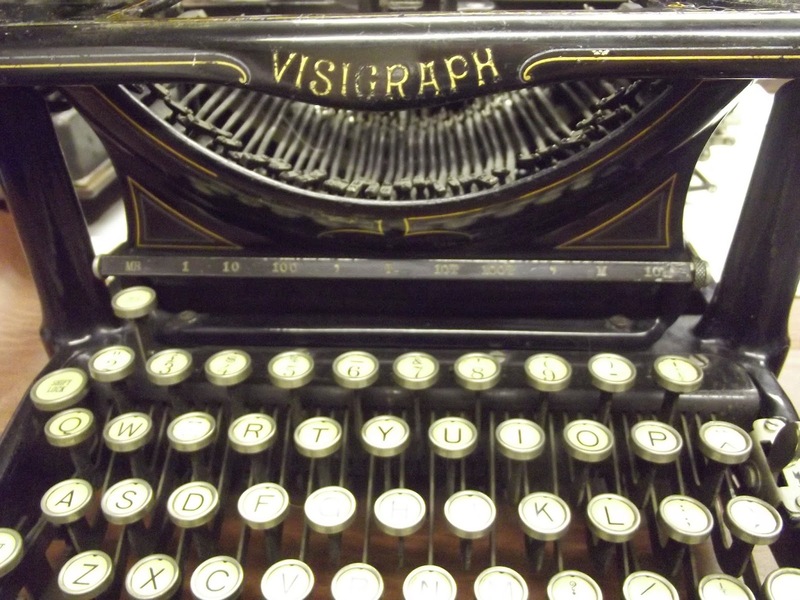 As for the new Visigraph typewriter, the idea was for Charles to advise, Walter to supervise production and Frederick to run the business. Yet towards the end of the year the Visigraph company more or less advertises itself as being for sale (saying, at the same time, that it is also working on a portable). 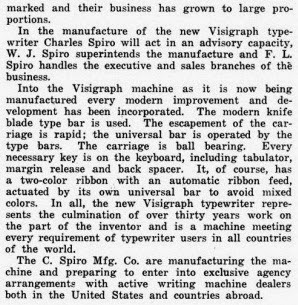 December 1919: Before the new Visigraph standard typewriter is produced, all tools, dies, patterns and patents belonging to the Columbia Typewriter Manufacturing Company, the Visigraph Typewriter Manufacturing Company, and the C.Spiro Manufacturing Company are sold to the Federal Adding Machine Corporation, under the presidency of Jean Baptiste Belanger DeBeltrand (1874-1949). 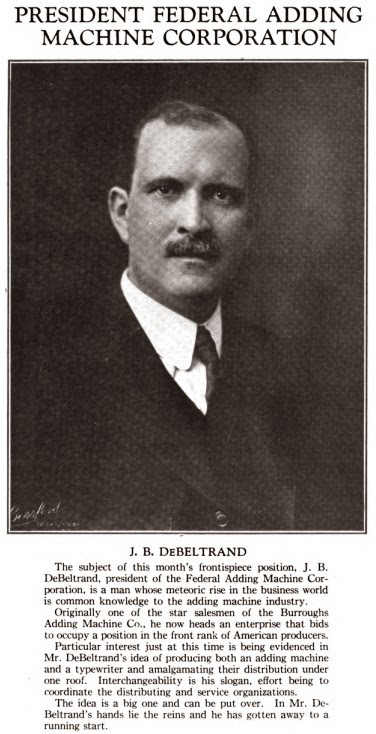 DeBeltrand was previously with Burroughs. 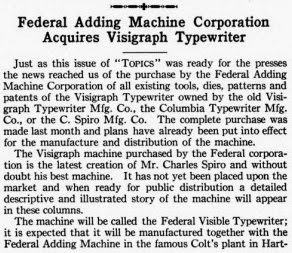 Federal, claiming to have $10 million in capitalisation, initially announces it will produce a Visigraph typewriter (with segment) at Colt's Patent Fire Arms Manufacturing Company plant in Hartford, Connecticut, and that later it will produce the same typewriter as the Federal. It also plans to make the new Visigraph/Federal at the Vickers plant at Brooklands, Surrey, in England. 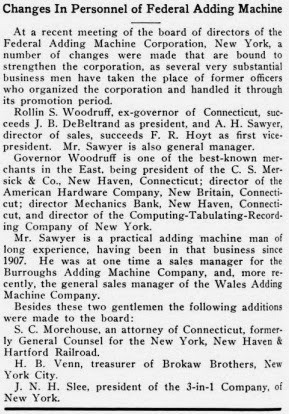 January 1920: The great typewriter engineer Edward James Manning is lured out of the typewriter wilderness and appointed second vice-president of Federal, a director of the company and general director in executive charge of the new typewriter venture. 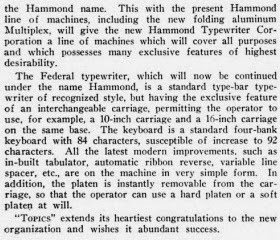 It should be stressed here that Federal always intended to make the typewriter which had already been re-designed by Spiro. So the Federal, with segment, is, like the Visigraph before it, a Spiro typewriter. "It is without doubt his best machine," it is reported. 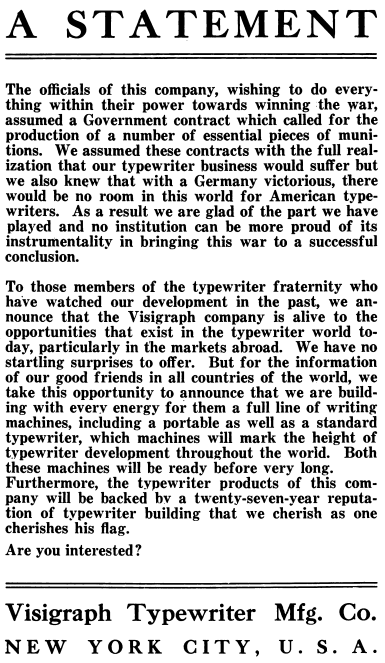 Federal announces it will have the new typewriter on the market within 90 days (presumably by April 1920), starting production with 50 typewriters a day, to be quickly increased to 100 typewriters a day. 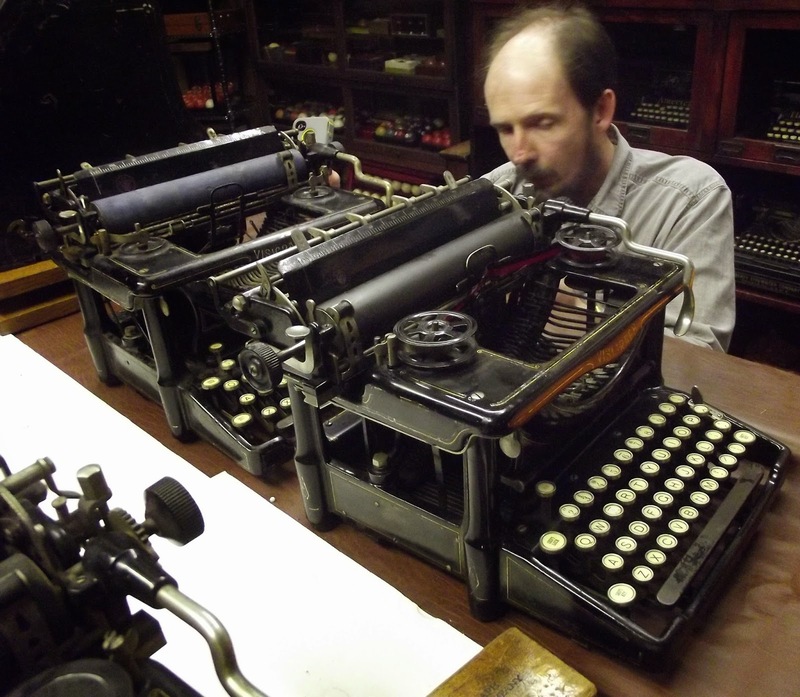 Its aim is 200,000 typewriters a year. 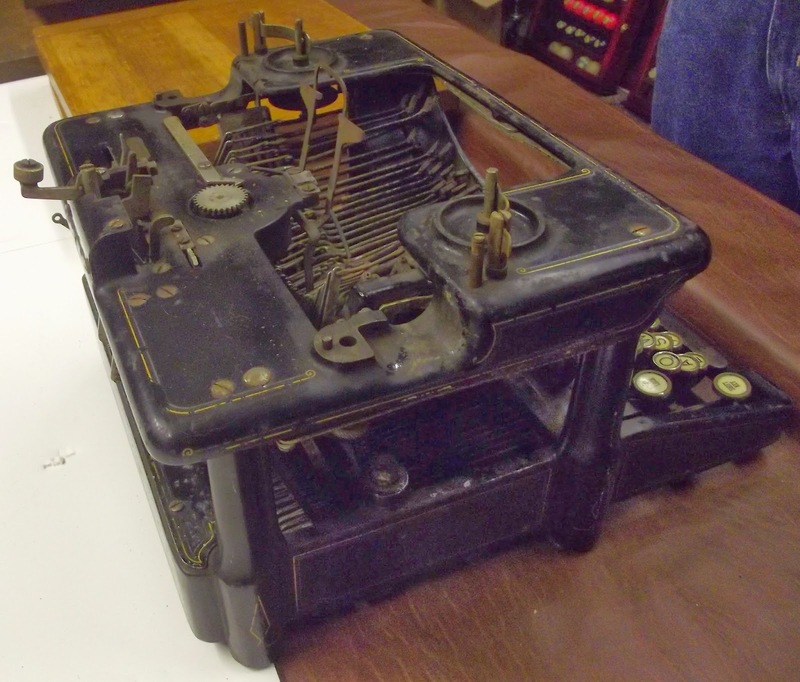 Its adding machine is already being made by Colt's in Hartford. 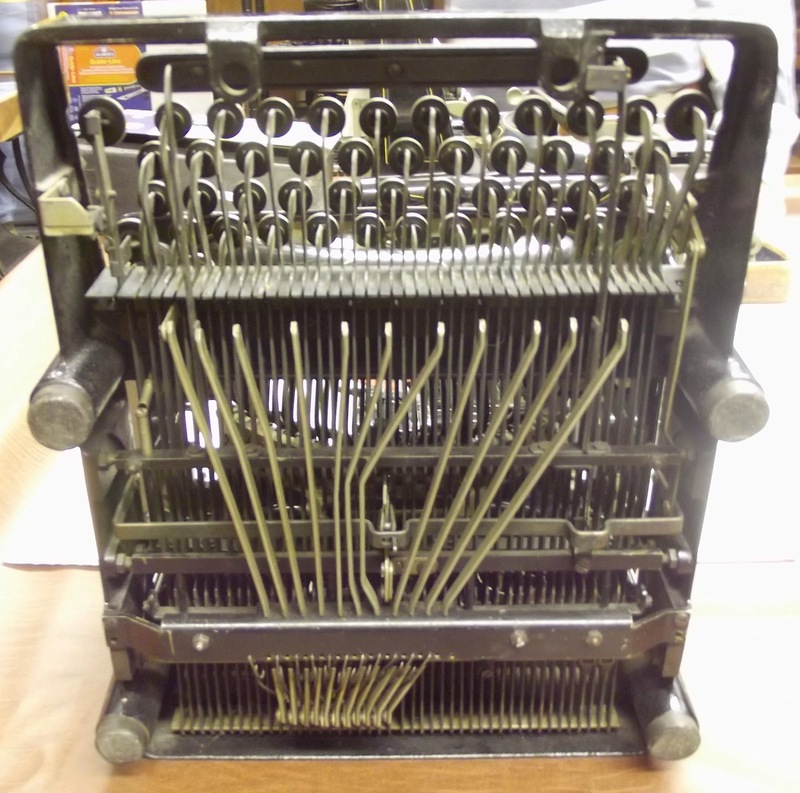 February 1920: Interestingly, even after Manning has been recruited to the cause, and lock, stock and barrel has been sold to Federal, Charles Spiro applies for three patents for improvements to his Visigraph (escapement mechanism, case shifting mechanism and interchangeable carriage), all of them assigned to the Federal Adding Machine Corporation. He applied for another (bell ringer and line lock) in September the same year, also assigning it to Federal. Presumably the patents for these changes were already part of the deal. 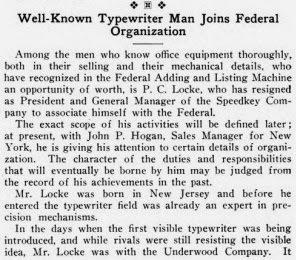 March 1920: Manning brings on board well-known typewriter company trouble-shooter Peter Charles Locke (1867-1961). 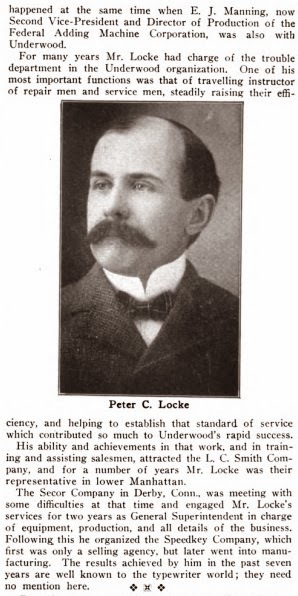 Locke had worked with Manning at Underwood. He had also worked for L.C.Smith and Secor. 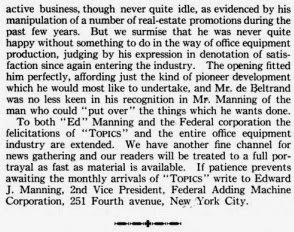 Manning also moves an "experimental and service" plant to Canal Street, New York City. 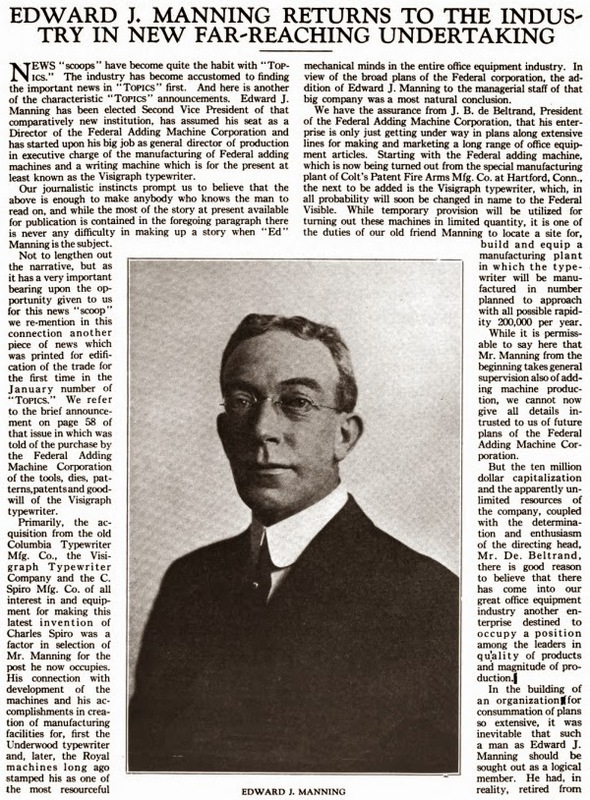 September 1920: In New York, Federal's directors make sweeping changes to the management of the corporation. 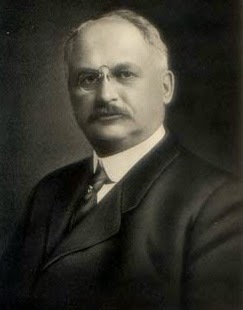 Former Connecticut governor Rollin Simmons Woodruff (1854-1925) takes over from DeBeltrand as president. The changes are said to "strengthen" the corporation. October 1920: Woodruff stands down as president and is succeeded by Clarence P.King. Woodruff instead becomes chairman of directors. 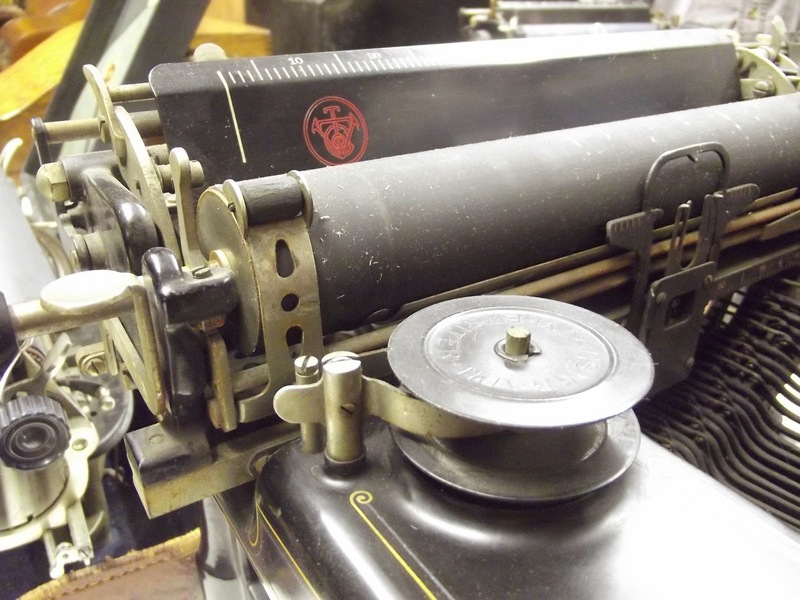 Development work on Spiro's new Visigraph/Federal has been completed and Colt's are delivering typewriters from Hartford. 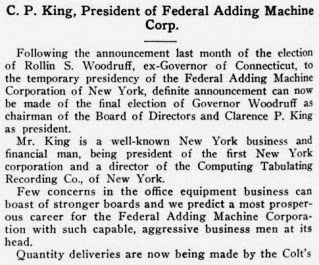 Federal expects to start shipping machines in January 1921. Another advertisement for a Visigraph with a segment appears. 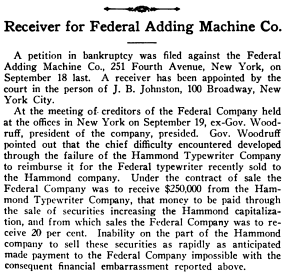 September 1921: Hammond, under new president Neal Dow Becker (1883-1955), buys the rights to make the Federal typewriter from the Federal Adding Machine Company. 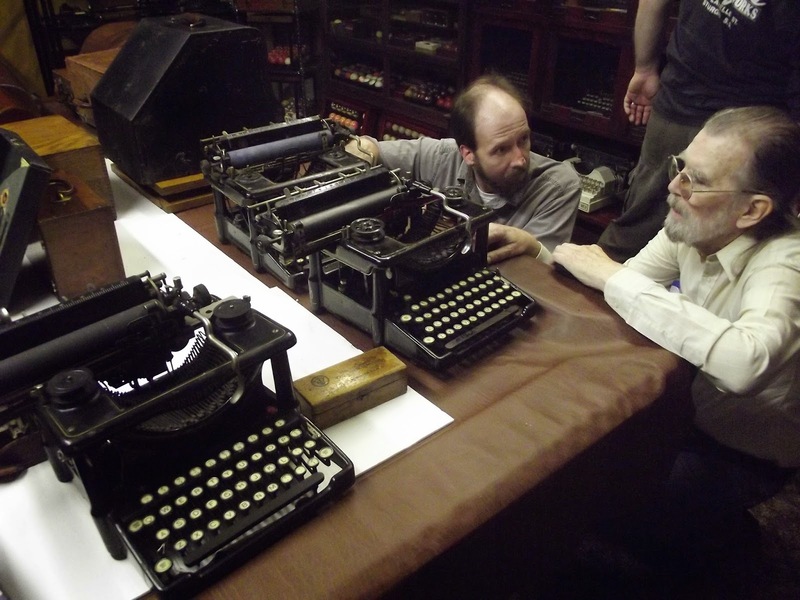 This is called "probably the second most important consolidation to ever take place in the typewriter industry". As part of the deal, Woodruff joins the restructured Hammond company as a director. The original plan is to market the Federal as a Hammond. 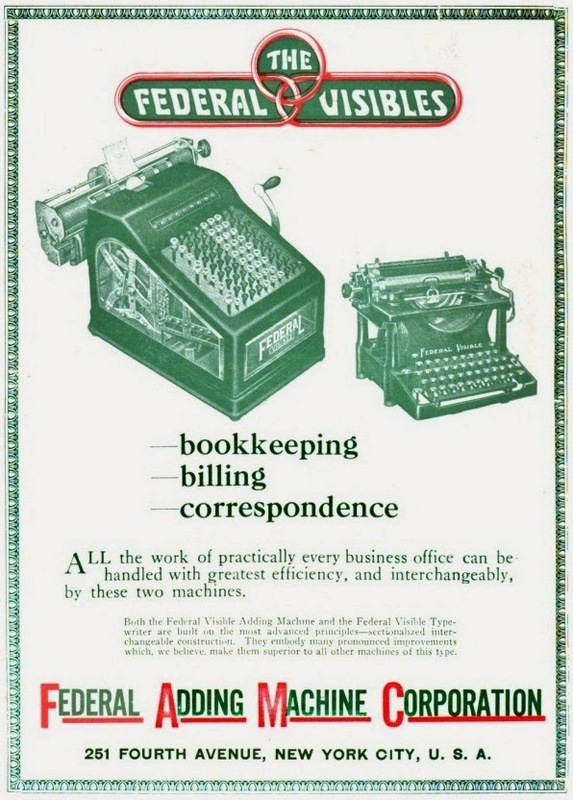 January 1922: The Federal is still being advertised as made by the Federal Adding Machine Company. 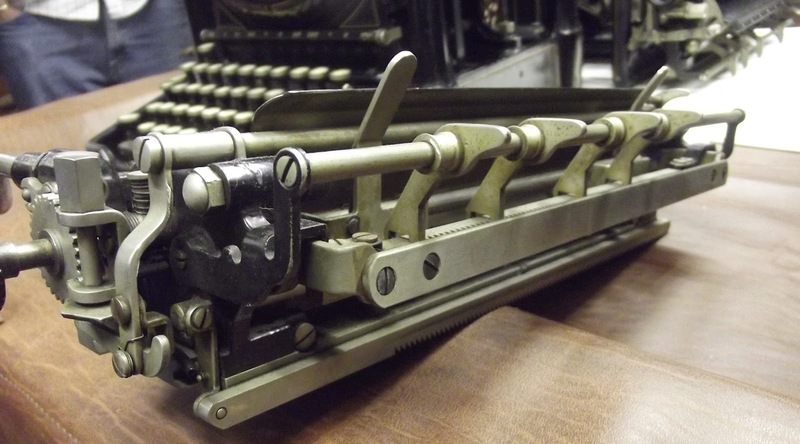 Hammond had been unable to pay the $250,000 for the Federal typewriter rights. By September, the receivers had been called in. 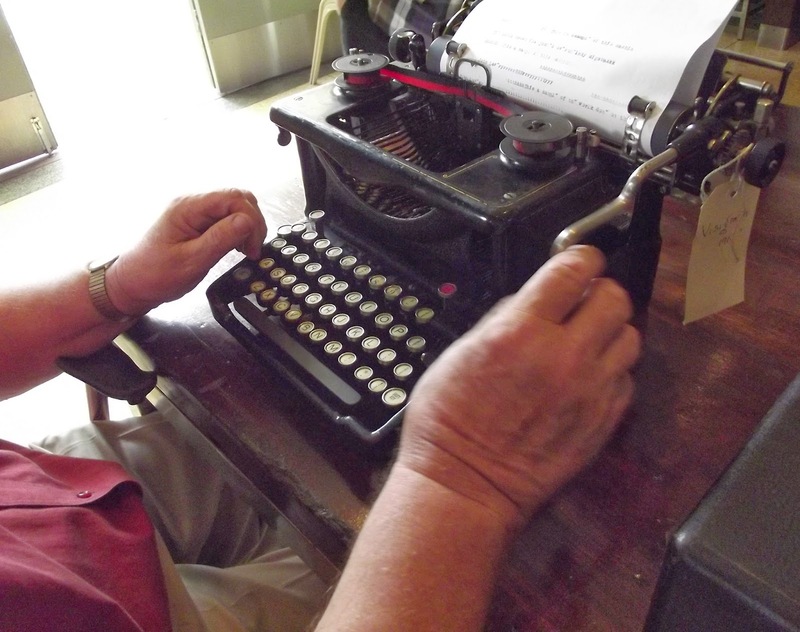 The trick to identify the littlest IBM Selectric I is the keyboard. The distance from the on/off switch to the edge of the bodywork, study your photo of the little red one, and then when you see the 13" and 15" models, the extra area will jump out at you.